Welcome to Cupcake Sunday at My Cozy Corner. I get so excited when I find something so cute I can't wait to show you. I was at World Market and I found this adorable cupcake kit. 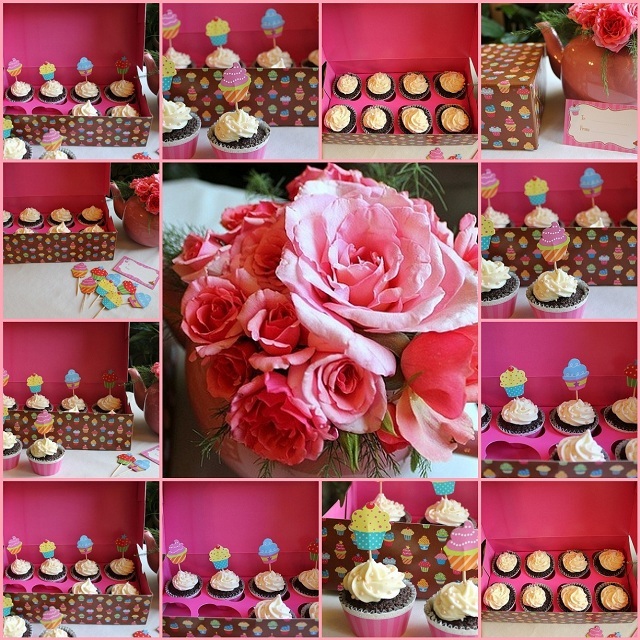 Includes chocolate cupcake mix, vanilla frosting mix, pink pearlized nonpareils, 8 cupcake aprons, 8 decorative picks and gift card. The box becomes an adorable carrier for the cupcakes. Wow!!! After I personalize my gift card and insert the corners of the card into the slits on top of the cupcake carrier I think I'll walk the box of cupcakes up the street to my granddaughters house and we can have a tea party. Sounds fun! I can't resist pink... Pink Saturday you know! Tournament of Roses, Dream Weaver and Simplicity are the roses in my pink tea pot. I added a little asparagus fern for greenery. I bought a Wilton Student Kit 'Decorating Basics' and in the kit was a Wilton 1M tip. 1M Swirl was a quick way to decorate the cupcakes. I added the nonpareils with scrap booking tweezers. I picked up one nonpareil at one at a time and placed them in a decorative pattern. When I arrive at my destination, I will insert the picks into the center of the cupcakes. I love the cupcake aprons. I love to make my own cupcake aprons from scrap book paper or thin card stock. Please add only the permalink from your cupcake post. How very, very cute!! LOVE IT! I took my girls for cupcakes today! Love the kit... and I LOVE World Market, guess I will have to make a trip there! Ditto.... on loving World Market. Your cupcakes look so yummy! I've never seen a cupcake kit before. There is a World Market store fairly near by - I'll have to check and see if it carries these. These are adorable and what a convenience and fun kit for gift-giving. I'm sure your Granddaughter and you all had a great tea time with these cup cakes. So cute! Love the box. Thanks for being a part of Seasonal Sundays. Betty, These are really so cute! What a great kit! And the box is darling too! Thank you for participating in ON THE MENU MONDAY and bringing these cuties! I posted my "Boys of Fall" Cupcakes today. Thanks for hosting. I found out about you at On The Menu Monday! I love World Market also. I think I need to take another trip there. The cupcake kit is so cute! Thanks! !